Long famed for being one of the most amazing tiny boxes ever sold, the original Wharfedale Diamond spawned a positive dynasty of Diamond branded speakers. I remember a friend with a home recording studio who swore by his active iteration Diamonds. They were an early Diamond with an amp in one box and two midbass drivers straddling the tweeter above and below on each enclosure so as to be 'double'. They were absurd little spuds in what they did and how much they cost. This system, though, called the Diamond 9 HCP (as in Home Cinema Package) is the 5.1 distant descendant from those days. In classic Wharfedale style, you get a lot for your money, particularly a set of Kevlar cones for less than one might expect such posh materials to cost. The enclosures aren't the biggest but they really rock. The woofer has 150W on tap, which helps. Tim Burton's Wallace and Gromit was played through this system, but I also spun Nick Park's sonically fantastic Curse of the Were-Rabbit claymation epic. The overall sound was not quite as coherent as we were hoping for, but only in terms of pure hi-fi response. It has to be said that the impact, attack and sheer muscularity of these absurdly tiny boxes was quite amazing. They filled the room, allowed huge sound effects to be created (anybody for a thirty-foot howling bunny?) and placed sound accurately around the soundstage. Lots of big bass from the subwoofer helped give scale, although there was less delicacy and clever footwork to be had. The main sonic difference is to be heard in the tweeter portion of the sound, which weren't completely accomplished in reaching up to the ethereal tinkly zone. It is trite but true to say that it represents fabulous value for money, and that you get an awful lot of sonic performance for such low cost. It creates great soundstages and rapidly draws you into the action. If you have many 5.1 music DVDs or DTS CDs, or gravitate to a more articulate sound quality, then this system is probably not the best choice. 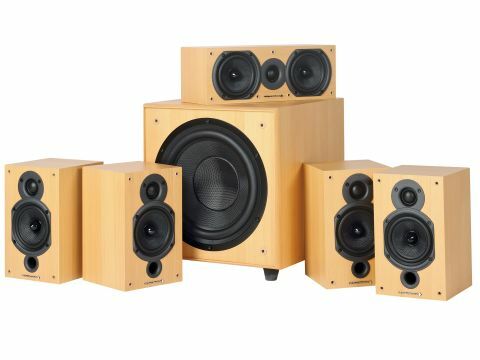 If however, you're looking for purity of sound but with more balls than delicacy, if you want to raise the roof with actioners and upset the neighbours, then the Wharfedale 9 Home Cinema Package is the one to get.